It can be challenging for a vegan to find alternatives for protein in the diet while staying away from animal products. There are many choices on the market but most fail to truly satisfy. You’ll find yourself scrambling to blend a large list of foods in order to get what you need or may be tired with the same thing, day after day. With the 180 Natural Protein Supplement, you have another option for the ultimate fuel for the body. Supply your system with the protein boost you need, without any traces of animal products or artificial ingredients. 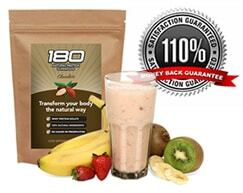 You’ll be amazed at the benefits you’ll find from using the 180 Natural Protein Supplement. The creators of the 180 Natural Protein Supplement set out to produce a protein supplement that would surpass the others on the market. There are no artificial colours or chemicals. Everything is natural and that’s the way it should be. You need to put substances in your body that can be found in nature, a philosophy you have probably already embraced by choosing the path of a vegan. This protein supplement has a long list of ingredients that were carefully chosen because they are packed with vitamins and nutrients that will help the body to run at maximum capacity. Pea Protein is a clean source of protein, along with almonds and chia seeds. Sunflower seeds bring in those omega 6 fatty acids. Coconut flour brings in the fibre. Pumpkin seeds are a good source of minerals while inactive Brewers yeast is important for contributing B-complex vitamins. All of these natural ingredients, and more, are carefully blended to create a protein supplement which can be used throughout the day to provide you with the protein you need to feel and look great. Why do you need a vegan protein supplement? Your body needs protein to function at its best. You’ll keep body fat down and bring your metabolism level up when you choose the 180 Natural Protein supplement. This powder can be made into a shake or smoothie, added to your choice of milk, or sprinkled on top of various foods. Give your cereal or salad some kick with this protein supplement. Make a healthy choice, using it for a snack or throughout the day. When you eat four to six small meals a day, providing your body with a vegan menu and the 180 Natural Protein Supplement, you’ll be amazed at the results. You have already made the decision to be a vegan. It’s time to try this phenomenal vegan protein supplement to ensure your body is getting everything it needs. Try the 180 Natural Protein Supplement and see the difference it makes as your energy levels go up and cravings disappear with a satisfied body.